Using this interior decorating information about the design principle of emphasis will allow you to play up any aspect of your room that you like, or to camouflage an area that you don’t like by drawing focus towards something else. All emphasis means is giving the viewer something to look at. This “something” will be the focal point of the room. In other words it is the very first thing you notice about the space. Look around your room. Do you have a natural focal point like a large fireplace, or tall windows that you want to play up? If not, then don’t worry, focal points can be created if a natural one isn’t present. The easiest way to highlight a natural focal point or to create one is with contrast. A wall or chimney breast can be emphasised by making it a darker or lighter colour than the surrounding walls, or by using texture - either visually with wallpaper or physically by having the surface clad with a different material. Since the contrast between your selected feature and the surrounds is increased it stands out and grabs your attention. Your focal point - or focal wall - can be further emphasised by arranging the furniture so that it leads the eye towards that wall. A focal point doesn’t always have to be a wall; furniture and art can be used as focal points too. Usually a bed or an elaborate free-standing bath can fulfil this purpose because of their relatively large size, but an artwork placed in isolation above a sofa or a bed will becomes a point where your eye is initially drawn to as well. Emphasising a space using artworks can be done with a single artwork or a collection of picture frames, or even a large rug. 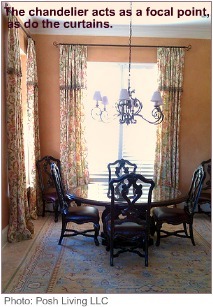 Additionally, ceiling-to-floor curtains can be used for emphasis, due to their size and colour or pattern. A room can have more than one focal point. This sometimes becomes necessary for the room to remain balanced and to prevent it from looking too empty and unfinished. Why do I need a focal point? A focal point makes a room seem more put-together and professional. Keep in mind that most focal points make you look up - thereby making use of empty vertical space. Otherwise everything seems “squashed” together at the height level that most furniture ends. •	Use a darker shade of the wall colour you are already using, or use a different colour, to highlight a wall. 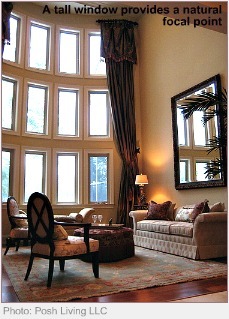 •	Add height visually - paintings, tall vases and tall furniture all add height and can become focal points. 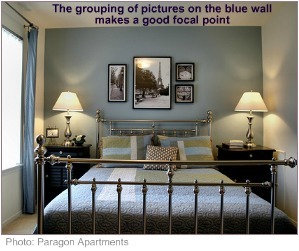 which you can use together with these tips on creating a focal point.